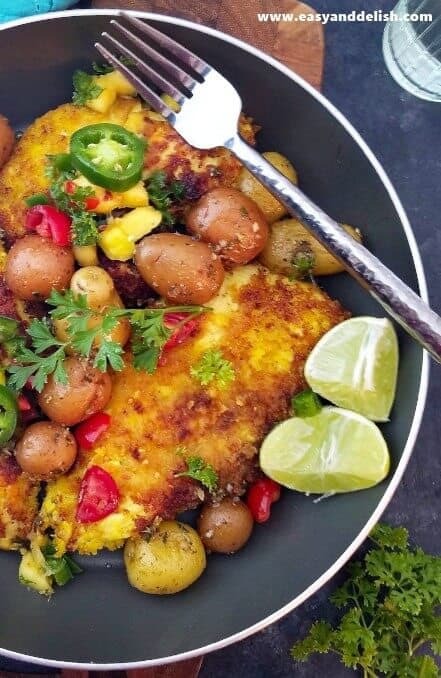 Turmeric Lime Chicken is an easy, 30-minute anti-inflammatory dinner dish made with breaded pan-fried chicken. It can be served with fresh mango salsa, with vegetables, or in a sandwich. Having a busy day? Well, me too! Need a dish that is easy to prepare for your family, yet on the tasty, healthy-ish side? Well, have I got the perfect solution for you: this Turmeric Lime Chicken. It is made with simple ingredients such as chicken breasts seasoned with salt and pepper and marinated in minced garlic and lime juice. The chicken is then breaded with a mixture of turmeric powder and panko crumbs, and finally pan-fried in vegetable oil. It is a bold dish with a vibrant orange color — which can be served preferably with either a fresh mango salsa, any roasted or steamed vegetables of your choice, or in a sandwich. It is food at its finest— a dish that can be enjoyed all year round! Turmeric is a good-for-you spice with health benefits due to curcumin, its main active ingredient. Turmeric is known for its anti-inflammatory and antioxidant properties, and also for giving curry its yellow color. Both the lime and cilantro in this dish make the dish even more flavorful. So please sit down with your family and enjoy a comforting dish with a combination of both Indian and Latin flavors. This dish is so easy to make that my ten and eleven-year-old kids helped me prepare it. Start by making 4 small cuts on the top of each chicken breast and season with salt and pepper on both sides. This will help the flavors of the marinade penetrate quicker into the meat and allow the chicken breasts to cook faster and more uniformly. 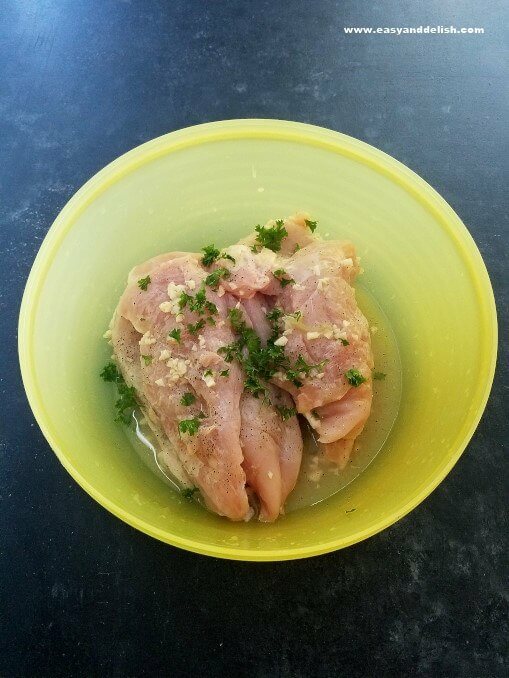 Then, mix fresh lime juice, minced garlic and chopped cilantro in a large bowl and place the chicken breasts into the marinade. Cover the bowl and let sit for about 30 minutes at room temperature. Beat the eggs in a bowl using a fork. In another bowl, combine both turmeric powder and panko or bread crumbs. Place each chicken breast in the beaten egg bowl and turn to cover in egg. Then coat both sides of each chicken breast with the turmeric/bread crumb mixture. Pan-fry the chicken breasts in vegetable oil over medium heat for about 6-10 minutes per side. NOTE: It’s important to cook in batches in order to not overcrowd the skillet and lower the temperature. Once chicken is cooked through (with no sign of pink), place onto a large plate lined with double paper towel to absorb part of the oil. Serve topped with a fresh mango salsa, roasted or steamed vegetables of your choice, or in a sandwich. Remember any leftovers should be covered and refrigerated for up to 2 days. 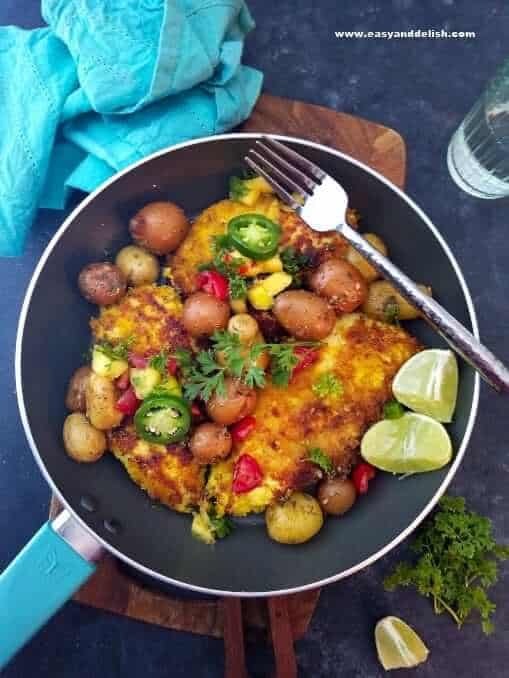 Turmeric Lime Chicken is an easy and quick anti-inflammatory dinner dish made from breaded pan-fried chicken that can be served with fresh mango salsa, vegetables, or in a sandwich. 6 skinless, boneless chicken breasts (NOT thick) You can buy 3 thick breasts, butterfly and cut in half each to get 6. Place each chicken breast in the beaten egg bowl and turn to cover in egg. Then, coat both sides of each chicken breast with the turmeric/bread crumb mixture. 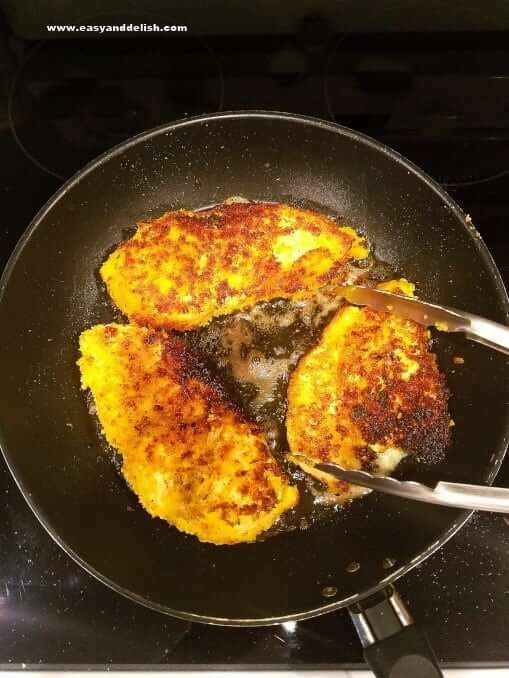 Pan-fry the chicken breasts in a large no stick skillet using half the amount of vegetable oil over medium heat for about 6-10 minutes per side If necessary, clean skillet carefully with paper towel between batches to avoid burned bread crumbs. It's important to cook in batches in order to avoid overcrowding the skillet and lowering the temperature. Once chicken is cooked through (with no sign of pink), place onto a large plate lined with double paper towel to absorb some of the oil. Serve topped with a fresh mango salsa, roasted or steamed vegetables of your choice, or in a sandwich. Remember any leftovers must be covered and refrigerated for up to 2 days. 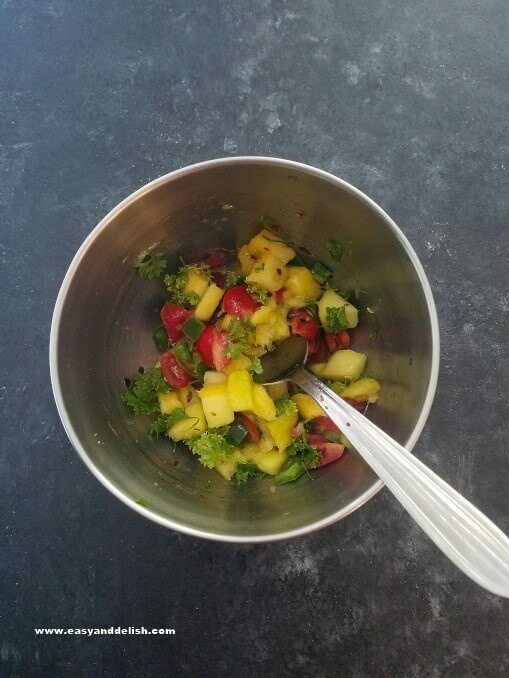 Get the recipe for mango salsa!!! If desired, skip the avocado. Very much into including turmeric in our daily diets. This scrumptious chicken recipe will be a great addition to my dinner planning. 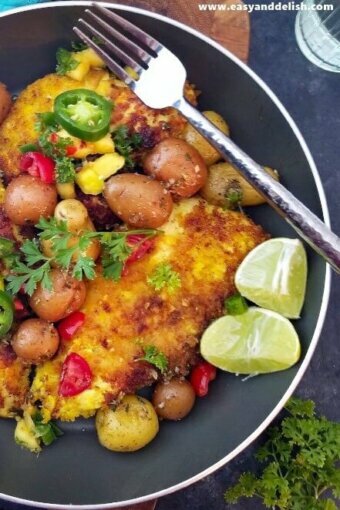 I never thought of adding turmeric to breaded fried chicken, and I love too the lime you added, sounds terrific as usual, Denise! I was looking for some new chicken recipes for my new diet list. Your Turmeric Lime Chicken seems so mouthwatering to me. Hope it will be really delicious. Thanks for the nice addition. Enjoy, Andrea! 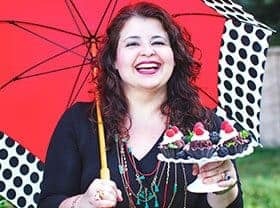 My entire family approved this recipe. It was my forst time making this dish. This looks good — love turmeric — it has wonderful flavor and color. And talking about flavor, wow, this dish is loaded with it! Really excellent — thanks. This recipe seems a masterpiece. Definitely deserves a try from my end..